Making a difference | News by Wales Express News, People Before Profit! Cabinet Secretary for Communities and Children, Carl Sargeant visited two projects at Caernarfon Tre’r Gof site this week to see the social value of Cartrefi Cymunedol Gwynedd (CCG)’s work in the community. 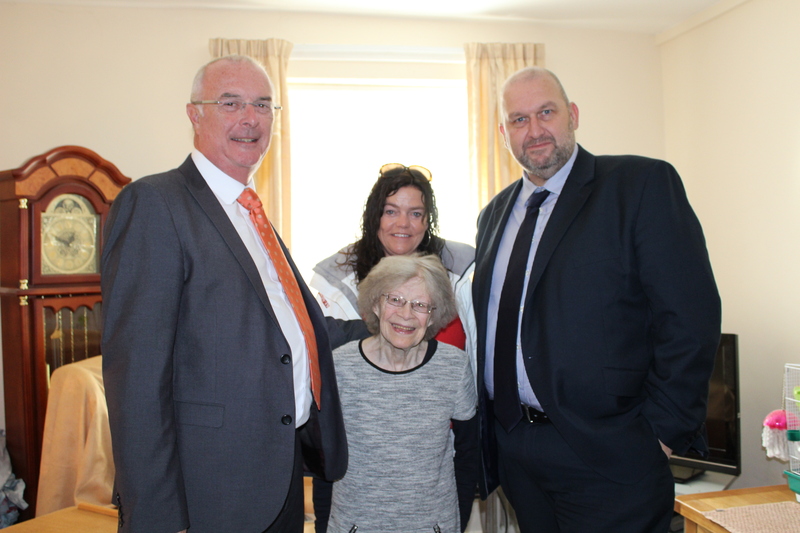 CCG Chairman Medwyn Hughes, Mrs Margaret Denman, CCG Tenant Support Officer Haf Evans and Cabinet Secretary for Communities and Children, Carl Sargeant. The visit showed how the largest housing association in North Wales, CCG, are providing much more than bricks and mortar, working in partnership to support vulnerable people as well as the positive effect of their work on people’s health and wellbeing. Meeting with CCG Chief Executive, Ffrancon Williams, Chairman of the Board, Medwyn Hughes and some of CCG’s frontline staff, the Minster saw for himself how the support CCG provides is making a real impact and difference to people’s lives. He met Mrs Denman, who is a frail and vulnerable tenant who receives support from CCG’s tenant support team. The intervention work by the team has enabled her to stay in her own home and improved her health , and demonstrates how CCG can acts as a partner within the health sector. Ffrancon Williams, CCG Chief Executive said: “I’m very pleased and grateful that Carl Sargeant has taken the time to visit us to see first hand some of the work we are doing to improve tenants’ lives and also what we are achieving by working in partnership. Carl Sargeant also saw how working in partnership with local charity GISDA is helping the lives of local young people. CCG works with GISDA to support and maintain successful tenancies so that young people who may not have had the best start in life can eventually move forward and gain their own tenancies. GISDA use six of CCG’s flats at Tre’r Gof as ‘moving on’ flats for young people who have been homeless or faced difficulties in the past in securing accommodation. He met Tyron Williams, a 17-year old who has been living in Tre’r Gof and discussed his journey so far and future ambitions. Sian Tomos, Chief Executive at GIDSA said: “We are very proud of our ‘moving on’ flats at Tre’r Gof. The partnership between us and CCG is based on the similar values of both organisations, which is to provide support and quality tenancies. We strongly believe that securing a nice new flat makes a difference in the way that the flats are respected and better the outcome for young people. Next articleTraffic Monsoon Update: You gotta stop watering dead plants.